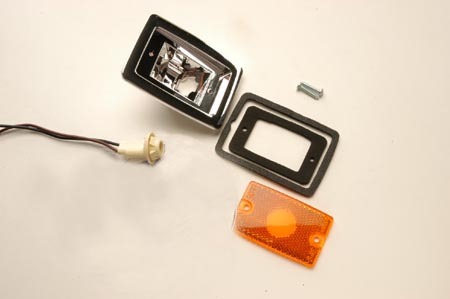 This is a brand-new front side marker light assembly to fit all Scout II trucks, as well as 1971 to 1975 D-series pickups and Travelalls. This comes complete with new chromed plastic bezel, lens, lens gasket, mounting gasket, and screws. Nothing makes as big a difference as new lights! NOTE: The light socket is pictured, but not included. For the rear markers, see SP13013.